I have been going through a transformation of sorts. This has been a time for me to reflect on who I am and how I got to the place I have. One of the biggest revelations for me is to follow my intuition. If something doesn’t feel right, make a change. Don’t sit there hoping you will feel differently. Trust your gut. It knows more than you think it does. My gut has been telling me something for a while but logically I didn’t want to accept it. I thought I would eventually feel or see something to make the situation right. Or what I thought was right. But it wasn’t right. This is where being logical hurts me. I don’t let myself feel. I live my life so black and white or right or wrong sometimes that I don’t tap into my emotions. I feel like huge weight has been lifted off my shoulders now that I have accepted and trusted my gut. 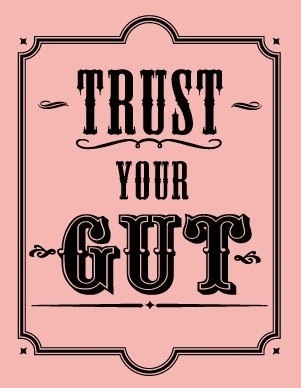 Do you trust your gut or intuition? How do you allow yourself to feel? Please share your story with me & others. We all could learn from it! I needed to read this today. Thanks for the inspiration!